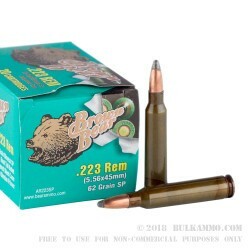 A budget .223 Remington ammo with steel casing and a Berdan primer. This is a great value for a hunting type round that has a good history of being used in a wide variety of firearms. Steel ammunition is a lower cost alternative to brass cased cartridges and will work in any mainstream firearm that is made to standard tolerances. The costs savings is immediate and can give you more money to spend on more ammo or shooting accessories and guns. This is a 62 grain soft point projectile (which will pull a magnet - so be aware if your range does not allow it) and is backed by a stout powder charge. The 62 grain bullet is best served out of a 1 in 9 inch twist; 1 in 8 twist or a 1 in 7 twist, so the larger bullet can be better stabilized before it exits the barrel. Given the weight though, you can expect better hitting power and longer flight in windy condition which improves upon the normal 55 grain ballistics in certain situations. The Berdan primed steel cartridge casing is not reloadable, but the value of the cartridge’s build is high. Q: Are the cases coated with lacquer or some other substance? Posted On: 9/2/15 By: Patrick G.
A: Hello Patrick, The Brown Bear ammunition is loaded in a lacquer coated steel case.